Now that summer has officially arrived, the heat and humidity that inevitably come with it are also here, and we’ve reached the time of year when protecting our tools from rust should top our to-do lists. Of course, the best way to eliminate rust from your shop is to keep it from ever even starting. A preventative strategy is most effective, and this quick guide will explain how to do exactly that. And if you’ve already noticed some rust creeping up on your machines and other tools, the guide also provides some great tips for removing it and making sure it doesn’t come back! 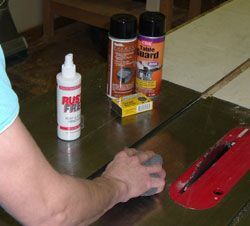 Read on to learn how to stop rust from taking over your workshop! Summer Projects: Downloadable Woodworking Plans for Kids Your Woodworking ‘Bucket’ List: What’s on it?